Body language has a considerable role to play in parliamentary discourse. One thinks of dismissive hand gestures or the occasional satirical smile. We witnessed a different - but still significant - variant of the genre in play at Holyrood today. It emerged during one of the opposition speeches, that of Willie Rennie, he who has the enviable task of shepherding the Liberal Democrats. Nicola Sturgeon had set out her programme for government. It was delivered, mostly, in a deliberately workaday fashion, perhaps in recognition of the presumption that mid-Brexit Scotland is in no mood for flamboyance. What new laws are the Scottish government planning? But opposition leaders chose to interpret this in an alternative fashion. Ruth Davidson of the Tories said the speech reflected a mid-point parliament, somewhat stuck. She said the FM's approach was "knee jerk, backside covering, just-in-time-ism". No, me neither. Richard Leonard, for Labour, listed the summer visits he had made. Thankfully, he had forgotten to bring the holiday snaps. Still, the message he had garnered from these sojourns was that the government lacked oomph. Where, he asked plaintively, was the vitality, where the driving force, where the real radical vision? For the Greens, Patrick Harvie also lamented the absence of radicalism. But he wanted the Green version, turning away from such irritating matters as GDP and export growth. He also wanted substantial change to the system of local government finance. Without which, he said once more, the Greens would not contemplate a budget deal when those discussions arise. So far, so familiar. But, on the day, it fell to Willie Rennie to provoke an outbreak of body language responses on the front bench. The speech, he said, was "light on content". Jeane Freeman looked as if she had swallowed a wasp, with no resort to the vegetarian option. Mr Rennie then declared that "every government runs its natural course". This one, he added sardonically, was "well past its sell by date". John Swinney studied his papers. Nicola Sturgeon looked at her mobile phone. We were, he continued, into the end game (Nicola Sturgeon glanced at her feet). There had been a "special air of desperation" since the independence referendum in 2014 (Ms Sturgeon gazed in mute rapture at the ceiling, perhaps hoping a beam would come loose again). The first minister, he continued, should "get out of her bunker". Ms Sturgeon stared, purposefully, into the middle distance while Mike Russell fidgeted, elegantly. And the speech itself? The programme? It was substantive, without pursuing a bold or obviously new narrative. But, then again, as noted earlier, perhaps that is in keeping with the zeitgeist. Ms Sturgeon had signalled in advance that this programme would build upon last year - indeed upon the last decade. There was nothing wrong with that, she insisted. It was not necessary to invent the wheel anew each time she stood up. Snag is that our impatient, restless body politic - and its accompanying wicked media - demand persistent novelty. So you've invented a wheel, eh? Tchah. Pshaw. We want more. We want a car without wheels. We want a rocket to Saturn. Secondly, she is not - yet - in a position to set out her new thinking on the subject which most fascinates her supporters. That of independence. She has promised a statement on such matters when there is clarity on Brexit. I suspect we may have to wait quite some time before we get a substantive update, as opposed to a stand-by analysis. Thirdly, the business of daily government - as opposed to political rhetoric - is consumed mostly by hard, detailed work. And so Ms Sturgeon offered an extensive litany of the challenges ahead - in education, in the health service, in the justice system - and the policies she intends to introduce to tackle these challenges. In particular, she announced additional money - and initiatives - to enhance mental health care. 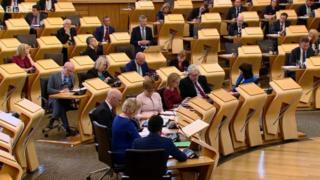 To be fair to the FM, she has made this a core personal issue - although, largely, that has been in response to parliamentary pressure, again most notably from Mr Rennie. One could also see parliament doing its job in the announcements from Ms Sturgeon on measures to reduce hospital waiting times. She has been asked about this week after week by Richard Leonard, Ruth Davidson and others. To be fair further, there was one biggish idea in Ms Sturgeon's remarks - although, once again, that was building upon existing policy. This was to increase capital investment over a prolonged period - and perhaps including innovative funding methods - in order to bolster the economy. The focus, most notably, would be upon the low carbon economy. All designed, again, to mitigate the damaging economic impact which she foresees arising from Brexit. The dominant concern, at all points.